Pressage bandages are a revolution in wound management that will save you time & money when bandaging your horse's leg. They come in a wide range of sizes & hold dressings in place over the hock, fetlock or knee. Pressage Bandages are made of 3-way stretch fabric, which contours to the limb and allows and even distribution of pressure. They are easy to use and are secured with a zip and Velcro fastening. Simply place your primary dressing (eg Melolin), over the wound, then a layer of Orthopaedic Padding, then your Pressage. To help your Pressage Bandage remain in the correct position, it can sometimes be useful to put a strip of E-Band at the top & bottom. Pressage bandages come in either left or right leg fittings. 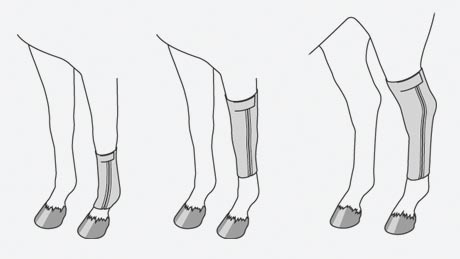 To measure the width of your horse's leg, it is recommended to measure the circumference of their leg, 15cm above the centre of the knee/point of the hock. If in doubt, go for a smaller size.